The Crane tower needs to be supported laterally at certain interval from the RCC Building. The interval can be say 30m. The manufacturer has given a lattice section to be used as a lateral supporting member. Assuming maximum force in the connecting member can be plus/minus 10T maximum, the member seems to be safe. The actual length of the member can be checked as per the site condition and the length of the member can be extended up to 11m as required upto splice joint. Try 6 Nos of M16 bolts to resist the force of 10T. 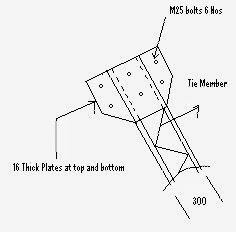 Therefore, Provide 6 Nos M25 Bolts to connect the member with the building. As per calculations, Crane tie should be provided in 7TH Floor, 14TH Floor and 19TH Floor respectively. What is Central VAT - CENVAT ?